Choosing a roof is similar to any major home purchase. It is important to research your options, compare your styles and decide if the cost is worth the features and benefits you want. Here are some guidelines to help determine what style and color best suits your personality and your home. Remember, you have to live with the choice the next 20-30 years so, choose wisely. Planning to Change the Paint? The first question to ask yourself is, do I want a roof primarily for function, or also for the aesthetics – to increase the curb appeal of my home? Answering this question will help guide you to the style of shingle appropriate for your home. If function is your only concern, then a standard 3-tab shingle may be your answer. Traditional shingles come in a variety of colors, suitable for any home. While they are not as durable, or in some opinion, appealing as dimensional shingles, they are quite economical and will get the job done. Dimensional Shingles: Design and Durability. Your starting point for a designer shingle is a Dimensional Shingle. 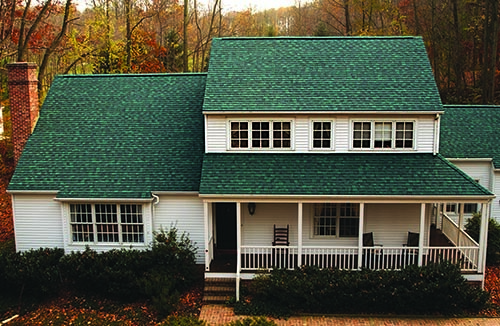 Dimensional shingles are made to give the appearance of slate or wood shake. The shingle itself is actually 2 layers of shingle material bonded together giving them a three dimensional appearance. Because of their design they offer more protection from wind and hail, withstanding up to 130mph winds, while also increasing their lifespan an additional 20-30 years over the traditional 3-tab. Luxury Shingles: Dramatic Curb Appeal. A step up from the designer shingle would be a luxury shingle. Luxury shingles create an even more dramatic look while giving the same enhanced protection from the elements. With scalloped corners, deep shadow lines, ornate shapes, or over-sized exposures, they add the maximum amount of curb appeal a shingle has to offer. First of all, remember, brick is permanent. When choosing colors, paint and shutter colors can always be changed, the brick color cannot. Start by comparing sample colors to the brick, then move to the siding or paint colors. However, are you planning to change the paint colors of your home? If you are planning to make a change to the outside color of your home in the next year or two, compare the new color to the shingle/siding samples. Go to the local hardware store, buy a 2X6 board and paint it the new color. Put the board next to the samples and place them next to the permanent colors on your home. Complimenting does NOT mean Matching! Some of the worst color mistakes I’ve seen are when a homeowner chooses a color that almost perfectly matches the siding or brick. It winds up being a monotone, boring, almost lifeless color scheme. Always try to compliment your colors, not match. Busy is Dizzy, and too much going on with your home is overwhelming. Rule of thumb, if the “non roof” part of your home is busy (multicolor in your brick, stone facades, multiple paint colors) you will want to choose a “toned down” shingle color. Too many patterns and colors overwhelm the eyes. However, if your home has a monotone feel to it (all white with black shutters), a vivid shingle color can add tremendous curb appeal. I have had many people ask me over the years about dark color shingles versus light color shingles and heat retention. A recent shingle study concluded, a totally white shingle made the attic temperature about 10 degrees cooler than a totally black shingle. However, when they compared the other shades (light & dark grays and browns) they found very little difference. My advice is to choose the color you like. You are going to have to live with it for a long time. When using samples to match your outside colors, look at the sample both in the sun and in the shade. Put the sample in a sunny place where the brick colors meet the paint and siding colors (example: by an entry door or on a window ledge). Then wait and check the same sample area when it is shaded. Make sure the colors are complimentary both in the sun and in the shade. For example, I think green shingles are a great look on the right home, but if it does not appeal to the majority of your buyers, you may have a harder time selling your home. However, if you are planning on staying put, a bold, rich color can really add character and charm to your home. We hope this was helpful information. We have assisted many homeowners in the Cincinnati Tri-State area with choosing shingle colors - We hope to help you do the same. At Advantage Roofing, we believe quality workmanship, blended with excellent service, is the foundation of a successful business and relationship with our customers.